With Your Crooked Heart is definitely a dark and moody read, so if you need something uplifting, maybe you should set this aside for a day you're feeling cynical. It isn't Dunmore's best, but it was interesting, to say the least. The novel centers around the life of Louise, a once-beautiful and coveted woman who finds herself trapped between two brothers of opposite personas. Married to the responsible rich brother, Paul, she is irresistibly drawn to his younger and reckless brother Johnnie. Anna is the result of a one-night stand between Louise and Johnnie but is raised by Paul, who can provide a better life and stability for Anna while Louise drowns herself in alcohol. "Her image looks at her angrily, as if it blames her for what it has become. We used to like each other, you and me. Look at what you've done to us". As days go by, Louise realizes that she needs more from her pathetic life, so when Johnnie finds himself in trouble with the mob, she decides to go with him into "hiding". Meanwhile, we read about Anna's growing up and what she learns about life, death and the appreciation of a stable household with Paul and her stepmother. The novel becomes increasingly depressing and I'm sad to say the novel doesn't improve as you read on. I really love Helen Dunmore 's writing, but this novel simply isn't a very good story. The ending is abrupt and is cloudy-- for some reason Dunmore's description of Johnnie's violent demise just isn't clearly detailed, and I KNOW I've got a hell of an imagination on my shoulders, so I don't get why I still don't understand what happens to him. If anyone reads this book and can figure it out, please let me know. Overall, when I finished With Your Crooked Heart , I was left feeling supremely dissatisfied. I just sort of sat there in disbelief, staring at the book in my hands, thinking "That's all?!" 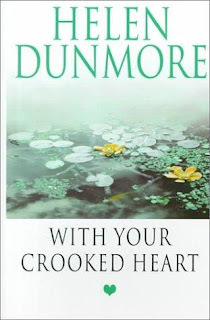 Regardless, I still remain a devoted fan to Helen Dunmore . My favorite book written by her is Talking to the Dead (1996). Her more recent titles include Counting the Stars (2008) and The Betrayal (2010).